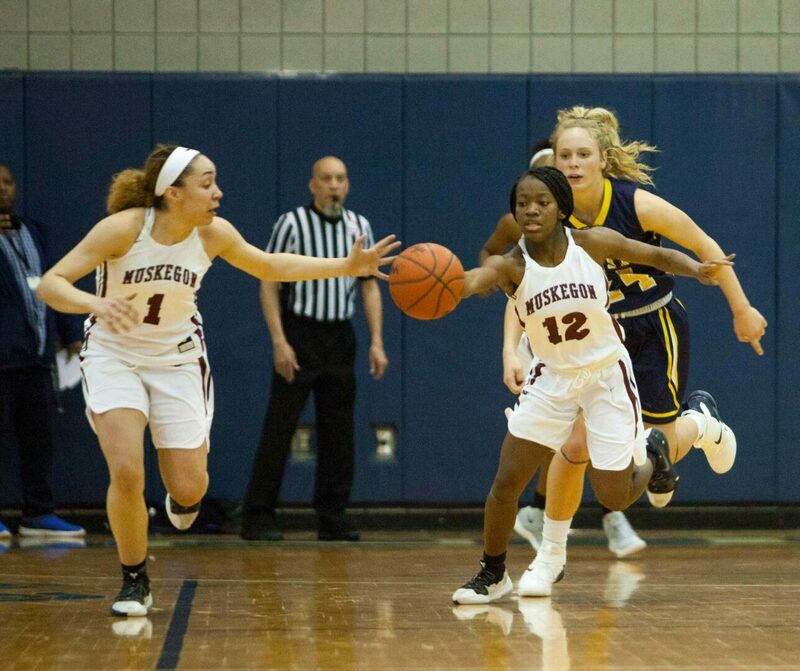 KALAMAZOO – After fighting back twice to regain the momentum and the lead in a tense state quarterfinal game, the Muskegon girls basketball team faced a worrisome situation with seconds left to play on Tuesday night. The Big Reds had been setting up to take what they hoped would be the winning shot with less than a minute remaining in a tied game. 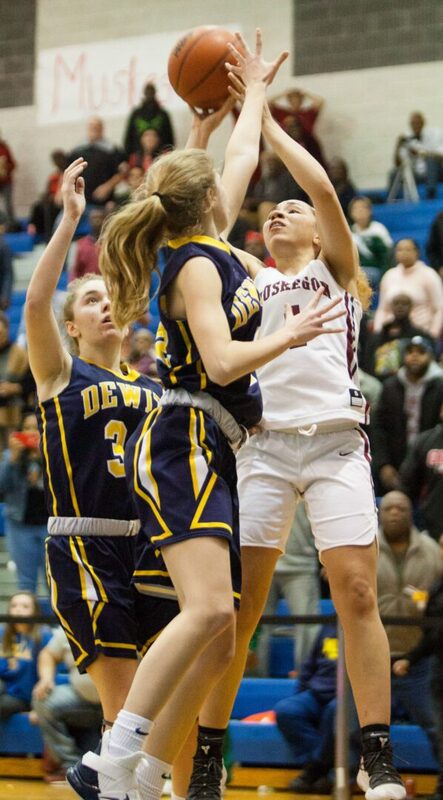 But then Muskegon’s Diynasti Dowell accidently dribbled off her foot near center court, the ball rolled out of bounds, and DeWitt took possession with 44 seconds left with a chance to steal the victory. But the Big Reds did not let that final setback ruin their plans. 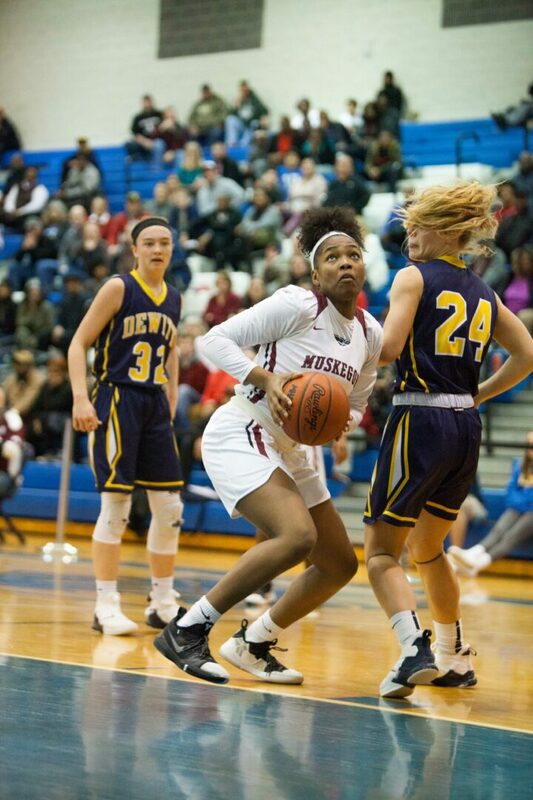 Brianna Alexander, a 5-foot-1 senior guard, knocked the ball away from a DeWitt player with less than 10 seconds left, then senior Miss Basketball candidate Alyza Winston did the rest. She grabbed the loose ball around center court, raced to the bucket and hit the winning layup with 4.2 seconds remaining, giving the Big Reds a breathtaking 53-51 victory over DeWitt at Kalamazoo Loy Norrix High School and a berth in the Division 1 state semifinals. 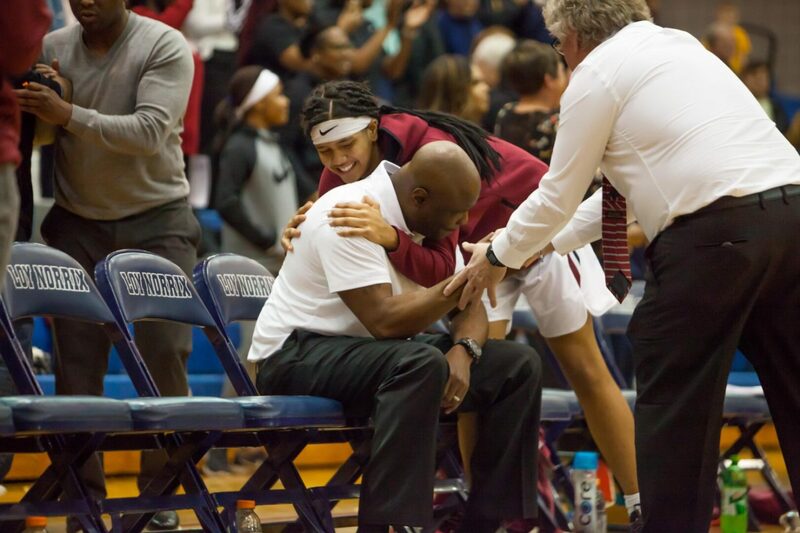 Muskegon Coach Rodney Walker, whose team is now 21-4, just smiled when asked about the decisive steal and layup. 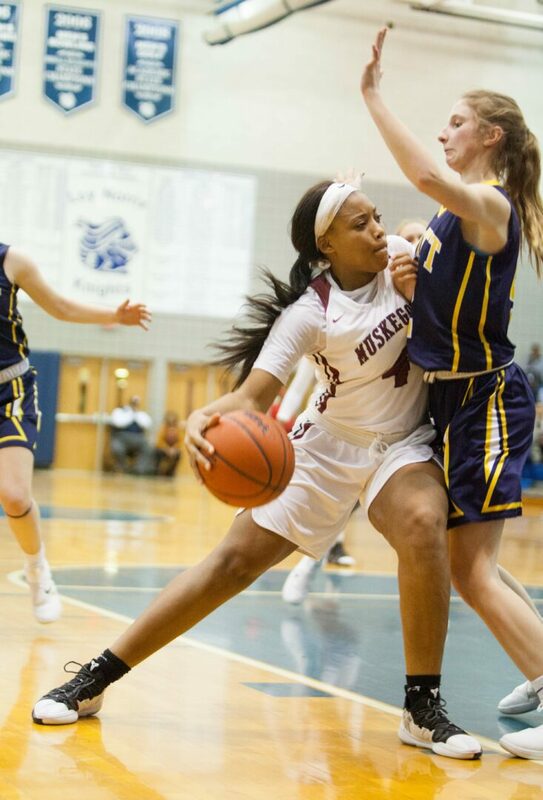 Muskegon, which was eliminated in last year’s state quarterfinal round, will make the first semifinal appearance in the history of the girls program on Friday at Calvin College. The Big Reds will face Southfield Arts and Technology, 23-1, at 2 p.m., with the winner advancing to Saturday’s state championship game. 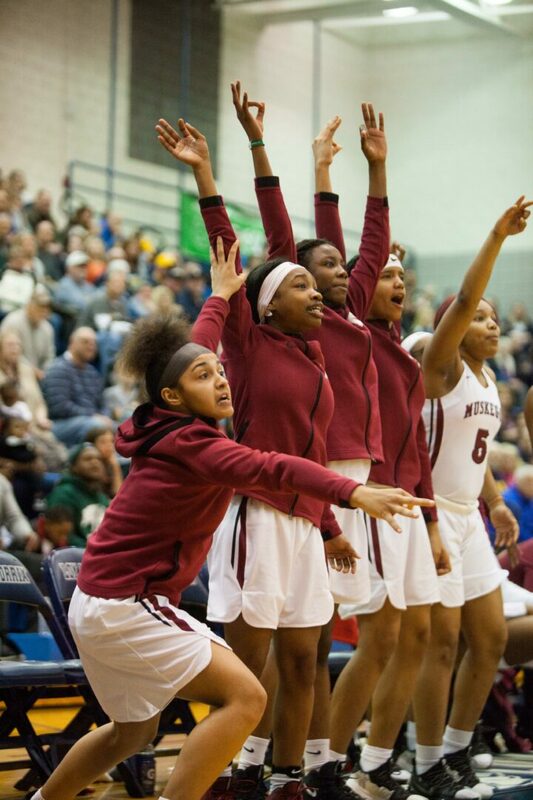 The game was a story of ups and downs for the Big Reds. They started out strong with balanced scoring and led 14-11 after one quarter. 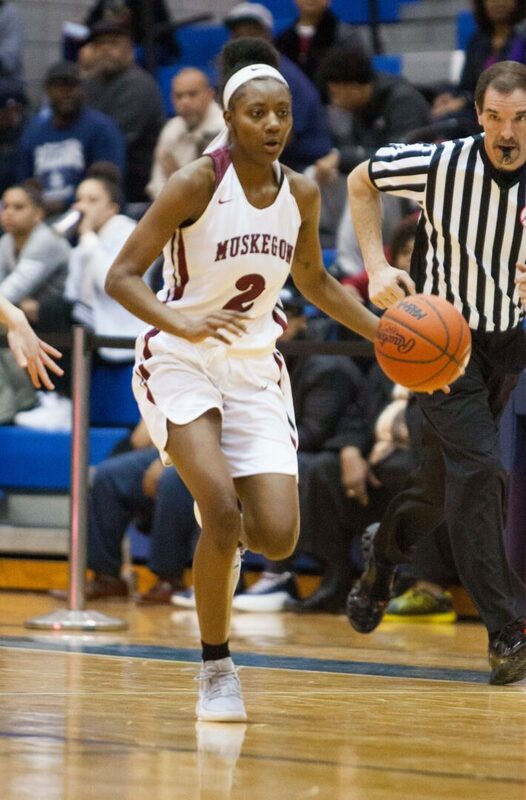 Dowell led four Muskegon scorers with a triple and a layup for five points. But the second quarter did not go very well for the Big Reds at all. DeWitt’s Annie McIntosh got very hot, scoring 13 of her 15 points, and the Big Reds went cold from the floor, hitting only 2 of 12 field goal attempts. DeWitt outscored Muskegon 15-5 in the second quarter and led 26-19 at halftime. But Winston and her teammates obviously sensed that their season could be in trouble, and opened the third quarter with a 9-0 run over the first 2 1/2 minutes take a 28-26 lead. Winston led the uprising with six quick points. But DeWitt refused to concede the momentum and fought back. The Panthers scored the last six points of the third quarter and had a 38-36 lead after three. DeWitt opened the fourth quarter with an 8-4 run and led 46-41 with 4:33 remaining, and the Big Reds again appeared to be in jeopardy. But again they regrouped. Alexander hit a triple with 4:14 left to pull Muskegon within two points. Deshonna Day nailed a free throw with 3:42 left, making the score 46-45. Then Nia Miskel grabbed an offensive rebound after a missed layup attempt and got the putback, giving the Big Reds a 47-46 lead with 2:59 remaining. The teams traded punches the rest of the way. DeWitt’s Maddie Petersen completed a three-point play with 2:51 left, giving DeWitt a 49-47 edge. Winston answered with a layup a few seconds later, tying things up again. Petersen hit two free throws with 2:42 left, then Winston responded again with a layup with 1:58 remaining, making the score 51-51. DeWitt missed a layup attempt after that, and Muskegon called time out with 1:14 remaining to draw up a play for the winning bucket. That plan went away when Dowell lost the ball by dribbling off her foot, and DeWitt seemingly had the chance for the winning shot. 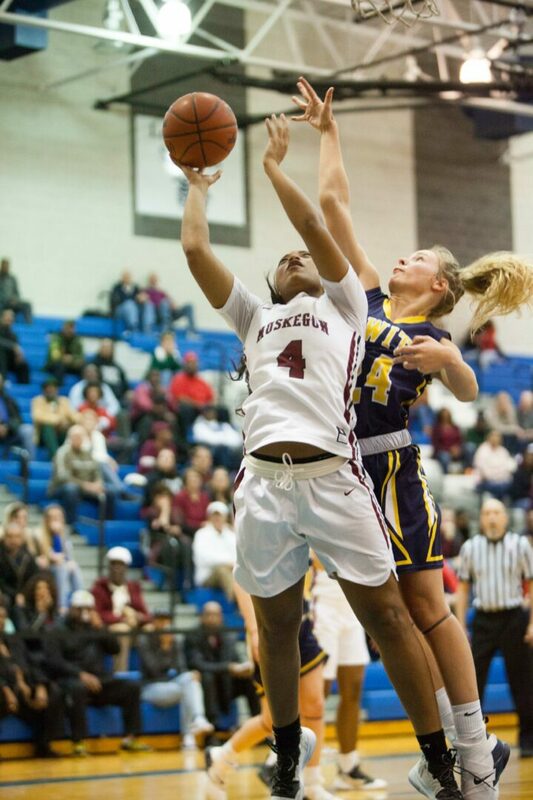 But Alexander’s subsequent steal, and Winston’s layup with 4.2 seconds left, gave Muskegon the exciting victory. Walker said it’s a very good thing that the steal occurred, because he thought DeWitt was in a very good position to make a basket and win the game. “I saw some things that were getting ready to happen, and if we didn’t get the steal we probably would have been beat,” the coach said. “The back side was wide open and our weak side help was not in place like it was supposed to be. Dowell and Alexander each finished with seven points for Muskegon while Day and Miskel each had five. 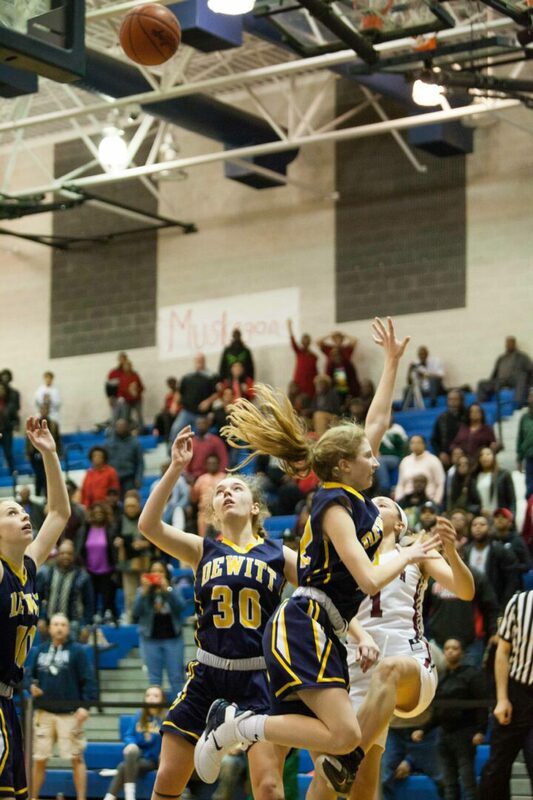 Peterson scored 19 points for DeWitt. “I personally wasn’t expecting it to be that close, but it was, but we’re made for games like this,” Winston said. “We were able to fight through adversity and pull out the win.